Get Basketball Hall of Fame Tip-Off Tournament tickets here at Ticket Galaxy! Ticket Galaxy is the Official Fan to Fan Marketplace of the Tip-Off Tournament. The Basketball Hall of Fame Tip-Off Tournament is organized by Naismith Basketball Hall of Fame featuring eight NCAA Division I men’s basketball teams. They divide the eight teams into two divisions. The two divisions are named Springfield and Naismith. 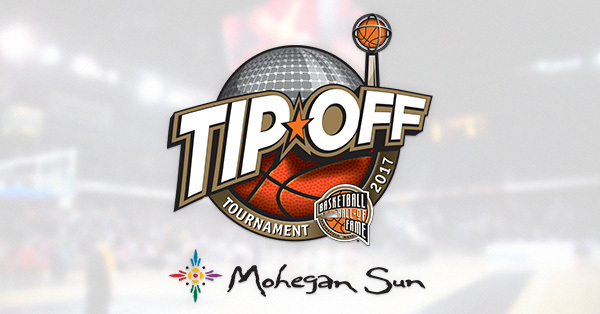 The tournament itself is hosted at Mohegan Sun Arena in Uncasville, Connecticut. The tournament was founded in 2011, the list of winners thus far from oldest to newest are: Kentucky, Ohio State, North Carolina, Providence, Purdue, Duke and Texas Tech in 2017. Ticket Galaxy is the Official Fan to Fan Marketplace of the Tip-Off Tournament. Purchase your Tip-Off Tournament tickets at Ticket Galaxy! Choose your event date and click "Find Tickets" to bring you to our array of seating options. Select your tickets on the maps page by clicking the price box. From there, TicketGalaxy.com will bring you to our checkout. Get your Tip-Off Tournament tickets quickly and easily today! Ticket Galaxy is the Official Fan to Fan Marketplace of the Tip-Off Tournament.